Gold Coast City is being touted as a key market to watch in 2017 - and new projects at its heart are proving to be in particularly high demand. As the city's property market continues to heat up, savvy investors are looking to secure property off-the-plan in key growth centres with the view of buying at today's prices to benefit from the pipeline of supporting development underway and planned. Robina/Varsity Lakes, which has been identified by leading Australian futurist Bernard Salt as a principal population growth, infrastructure and employment hub for the city over the next three decades, is proving a popular choice. 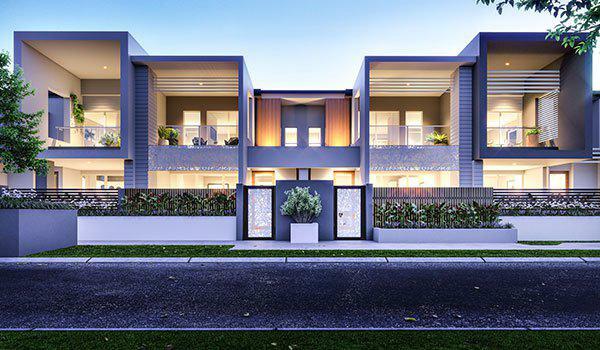 More than $14.5 million of homes have sold off-the-plan at the centrally-located $170 million Vue Terrace Homes, being developed by Robina Group on a prime parcel at the heart of Robina and overlooking parkland, since its recent launch. Robina Group sales manager Azura Griffen said purchasers had recognised the significant value on offer and wanted to get in now to take advantage. "A recent report by Urbis showed terrace homes in Robina had increased in value by 6 per cent per annum over the past decade," she said. "All of the factors that are driving that growth - high demand, low vacancy rates, new development and established roads, transport, shops, restaurants, schools, universities, hospitals and conveniences - are underpinning long term values. "Buyers are recognising this and are looking to get in now to benefit from the continued growth predicted for the suburb. "Bernard Salt identified Robina/Varsity Lakes as a prime centre to accommodate the phenomenal growth expected for Gold Coast City, with the population tipped to double to 1.2 million by 2050. "When you take stock of the Gold Coast today, there are very few regions that can match Robina/Varsity's capacity for growth and expansion - or its ability to provide diversity of housing and workspaces - with 50 hectares of approved developable land and a raft of key infrastructure and services already in place," said Mr Salt. "All the housing, the shops, the jobs, the health and other city centre infrastructure that pertains to the middle of the Gold Coast urban form will hold fast to the centrally located Robina/Varsity precinct. "Urbis research shows Gold Coast City has an extremely low vacancy rate of just 1.5 per cent, with the vacancy rate for terrace homes in Robina just 1.1 per cent. Ms Griffen said the demand for terrace homes was so great, there were often waiting lists of buyers before projects had even been completed. "When you consider a vacancy rate of 2 per cent signals a potential undersupply, the demand for terrace homes in Robina is evident," she said. "We brought forward the release of our latest project, Vue, to help fill that demand and have received interest from owner-occupiers and investors from around Australia. "Those from the southern states, in particular, can't believe the value on offer, with homes starting from just $599,000. "The six hectare secure-gated Vue Terrace Homes will feature a resort-style pool and lifestyle deck overlooking the 17 hectare Robina City Parklands. Stage one includes 71 three-bedroom, plus media, dual level homes with a modern and flexible design, European appliances, high quality finishes and NBN-capability. Construction is expected to start in the coming months. The Vue sales and display centre is open seven days a week from 10am to 5pm at Glenside Drive, Robina. For more information visit vueterracehomes.com.au or call 55 888 821.